Since mentioning a few days ago that my husband and I decided to homeschool our third- and first-grade sons this year, I’ve gotten several questions from readers about how (+where, why and even when) we do school. 1. We’ve only been homeschooling since September, so our experiences are hardly “seasoned”. We are definitely figuring this out as we go. 2. There are as many ways to homeschool as there are homeschooling families. Please take what I write here as descriptive, rather than proscriptive. Why did you decide to homeschool? Was it a financial decision? Homeschooling feels like a better match for our sons’ educational needs. Kansas City has only one Jewish day school option, which is a community school. While no school is perfect (not even homeschool! ), we felt that our educational goals for our children — both secular and Judaic — could be better met at home, at least for the time being. Homeschooling is a good fit with our “lifestyle” (both my husband and I work from home), and I’ve toyed with the idea for years. I’m sure people were surprised when we said we decided to homeschool, but it didn’t come from “out of the blue” for us. How long do you plan to homeschool? Is this your long-term plan? For right now, homeschool is working for us. Will it work when my oldest is in middle school? Will it work when I have all three at home? (My daughter is three years old and goes to preschool five days a week right now.) I don’t know. Life is ever-changing. I’ve learned never to say never — or always. What are you doing for your children’s secular studies curriculum? We are fortunate to live in the state of Kansas, where homeschool laws are pretty liberal. (Ironic, because it’s a very conservative state!) You can learn more about your state’s homeschool laws here. In addition to homeschooling families being able to completely pick their own curriculum in Kansas, we have a few different public school options for homeschool children. We decided to go that route – and enrolled our sons in the Maize Virtual Prep School, which provides all of the secular curriculum – from math to reading to science to geography. The curriculum is based on the Calvert methodology, which I’m overall very pleased with. The math curriculum uses Singapore Math, which I like a lot. In addition to sending us four HUGE boxes of text books, workbooks, and teacher manuals, Maize also provided laptops for each of our sons, and tons of other resources – like amazing math “manipulatives” and even a year’s worth of graph paper. Each family is assigned a teacher from the school district, and she helps me evaluate where my kids are at, and how we can better meet their needs. She is also very supportive of adapting the curriculum as needed, which I love. For example, I’ve started introducing some unit studies on topics I’d like my kids to learn about – or that they want to learn about. If my kids are either behind or above grade level, we can adjust that, too. My first grader, for example, is really strong in math, so we’ve been able to cruise thru most of the first grade curriculum – and will probably start him in second grade math by February. What are you doing for your children’s Judaic studies curriculum? This is another area that is “under construction”: They daven daily with my husband. I work with them on Hebrew reading – fluency and comprehension. We already integrate much of what they need to know (about brachot, Shabbat, chagim, etc.) into our daily lives. And they have tutors for limudei kodesh. For kodesh, both of our boys have a tutor. We’re making some changes to our first grader’s routine, but our third grader meets with his rebbe twice a week. I was worried that just two hours wouldn’t be enough, but after seeing this in action, I have been amazed at how much gets done in two hours of concentrated, one-on-one time. He’s definitely making huge strides in his chumash skills. I also do unit-studies with them on the chagim, and have found that chinuch.org is a huge help for curricular ideas and resources. Where do you get lesson plan ideas from? Google has been my friend for finding teaching resources and printables. For secular studies, one of my favorite resources is Teachers Pay Teachers. You can search by topic, and then drill down to grade level and even price (of course, I start with the free options!). For Judaic studies, again, I recommend chinuch.org. 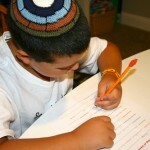 If you have younger children, you may like Mommyz’s Jewish Homeschool Blog for Montessori-inspired parasha and chagim activities. Truthfully, our schedule changes daily – so for those of you who were hoping to see a neat and tidy calendar, I’ll have to disappoint you. Mondays, Wednesdays, Thursdays and Fridays, I am in charge of their schooling. On Tuesdays, my husband is with the kids all day (while I work). He does Science Tuesdays – and is able to use the third grade curriculum to instruct both boys together. Each M/W/Th, we start out with a “morning meeting” – usually we do calendar work during that time. Then they do math, English reading, Hebrew reading, handwriting and sometimes social studies/geography or keyboarding (computer skills) with me. Most of the time, these subjects need to be taught individually – so I go back and forth between them, setting them up for independent work, while I then try to teach the other. My first grader needs more one-on-one instruction than my third grader, but they both still need a lot of individual attention. Balancing this has proven to be challenging to me — and I marvel at moms (and dads) that homeschool even more children at once. As I mentioned above, I also work on “unit studies” with them together. This week, for example, we’ll be doing work on Tu B’Shevat. Sometimes the unit studies are Judaic, other times they are secular. We did a three-week unit on American politics leading up to the Presidential election. The unit studies are taught to both of them, together, with individual assignments to their ability, as appropriate. Fridays are our catch-all day. If there are lessons we didn’t get to during the rest of the week, we do those on Fridays. But often we go “out” to have school – our favorite spots being Starbucks or the public library. We all enjoy this change of scenery! We occasionally do field trips on Fridays, or special projects. Some Fridays are “life skills” days – aka, helping mom in the kitchen get ready for Shabbat. I throw in some lessons about fractions (measuring) and elapsed time (if we put the challah in at 1:15 pm and take it out at 1:40 pm, how long did it bake for?). What extra-curricular activities do your kids do? When our kids were in dayschool, I had a strict “one activity per child” rule. I didn’t want to spend the three hours we had together each evening driving around like a crazy person. Now that they are home with me, we’ve (significantly) relaxed that rule! In the early evenings, they take Tae Kwon Do twice a week (my first grader has been taking it for three years and is a brown belt!) and have basketball practice or games three times a week. Our kids really love sports – and I’m happy for them to have the work-out while being with their friends. This year, we want to introduce some music studies, too. My third grader got a guitar from his grandparents for Chanukah, so we are starting lessons this month. For my first grader, we have a piano at home, and I’m looking for a teacher for him. How much time do you spend homeschooling every day? It’s hard to say exactly how much time we are schooling, since at home – anything can be “school”. At a traditional school, you know your child is there for, let’s say, eight hours. But are they “learning” all eight hours? Of course not. There’s lunch and recess and library and waiting-for-everyone-to-be-quiet-so-we-can-start. I’d say that I do three to four hours of formal academic instruction with my boys most days. (Fridays are a bit less structured, as I said above.) I don’t count their time with their Judaics tutors – since that time is “outsourced”. I don’t count art, music or athletics in that either. The three to four hours is strictly time that we spend in our school room on the “core” curriculum. There are no “filler” activities in that time, so I suspect their quality academic time is comparable to what they were getting in school. Do you school year-round? When do you take vacations? I love the flexibility that homeschool provides in terms of our schedule. We haven’t hammered down our summer schedule exactly, but I think we will school thru the end of June and then take July off. I plan to take most of September off for the chagim, so we may try to get a jump-start on school in August. Homeschooling has really driven home the message for me that we, as parents, are always educating our children. There are always opportunities to learn and grow and teach – and we don’t have to be in a museum (or a classroom) to do that! Don’t you worry about “socialization”? The short answer is no, I don’t worry. Our kids were in school until last May and have lots of friends that they are still in touch with regularly. They see them at basketball practice, at Tae Kwon Do practice, and at playdates. In addition, we are part of a very tight-knit community and they see their friends every Shabbat at shul – and we are often together with these families for meals. When my kids ask for a playdate, I honor their request as often as I am able. But no, I definitely don’t think homeschooling is hampering their social skills in any way. Plus, I think it has done wonders for our family-ization. They still fight, don’t get me wrong, but my sons’ relationship is much stronger and they have learned to turn to each for comradarie. I also love seeing them include their three year-old sister in their play more and more, as well. What’s your homeschool set-up like? We had a small guest room in our basement, which we have converted into our school room. I know plenty of homeschool families do homeschool at their kitchen table, and we often do lessons there as well. But I really felt like I wanted / needed a dedicated space. My friends in real life will attest to the fact that I LOVE our school room. It’s my favorite space in our house and makes me smile whenever I walk in there. I’d love to hear from other homeschoolers – so please feel free to chime in and add your experiences in the comments. As I said, our experiences are just that: Ours. They are far from definitive or authoritative, but I do hope that this post gives you a little bit of a glimpse into how we are making it work for our family. Kol ha-kavod!!! Makes me want to homeschool. You are so right that all parents are teaching all the time. I think that’s terrific you can use the school district’s resources for homeschooling. When my daughter went to the TLC school, they used K12 through the district. I wish our current yeshiva could do something like that – it would save so much on resources. I was awed at how much was available to us. When you’ve not sent your kids to public schools, you sort of forget what our tax payer dollars are doing – educationally at least! I didn’t know that. My schedule is get the work done when we can. I have 4 kids at distinctly different levels and I thrive on not being on a schedule. Somehow that works for us. Brina – do you have “school time” or does everyone do their thing throughout the day? Glad to hear that things are going well. NC requires a yearly standardized test which my boys did on Friday. They both did great. They were on target to advanced in all their subject. I was both thrilled and relieved as I considered this a good report for them and for me. After almost a year of homeschooling I got confirmation that I’m not screwing it up! Yay! I didn’t go the route of having someone who had my back so it was a particularly big relief as I selected all their curriculum myself and handle all the lessons myself. We do science & history together for our oldest boys too. Still haven’t integrated my youngest in and probably won’t worry about that till the fall or later. Totally agree about having a dedicated space having done it both ways. I still think of our talk at Starbucks about your curricular choices, Anne. Maybe one day I’ll be that brave! I want to see pictures of your new dedicated space – last I saw it was the kitchen table! Yes – there are a couple Yahoo groups that I’ve joined. I’m a lurker so far! Can you post a bit about how your kids feel about it? Was it something they asked for or wanted? How they felt at the beginning and if that has changed? Would you try to meet up with other homeschooling families for shared lessons? That’s an interesting question, Nicole! My first grader had asked to be homeschooled a few times and I knew that he would be good with it. He’s a homebody like me. I was worried, though, how my third grader (he’s super social) would take it. When I told him he’d get his own laptop and would never have to have homework, he was sold. Occasionally when he thinks I’m expecting too much or pushing him too hard, he’ll say, “I want to go back to school…” But we both know that he’s just fighting the inevitable – doing his work! There is one other Jewish homeschooling family in our community, but their children are at least three grades ahead of mine, so I don’t think sharing would work with them (right, D & D?). I know that a lot of families do enjoy “coop” type situations, but I honestly don’t think it’s my style. At least not for now. One comment I would like to offer is that many people of other religions, including Orthodox Jews, use some of the Christian curriculums for secular studies and omit/cross out things. The yahoo group has had a lot of discussion of that over time because it is possible to find a lot of useful things and just remove the other stuff. Interesting. Thanks for sharing that perspective, Kate. There is an amazing blog by Avivah Werner (who started the Jewish homeschooling conference) with tons of information and resources about homeschooling. Yep – I know her blog! Of course, she dafka made aliyah and put her kids in school the same time we decided to pull our kids out of school 😉 Life in flux! More power to you! We homeschool also but because my husband and I are both converts, the question of Judaic studies was obviously a big one. My kids are still little, but we have found room613.net to be a great resource. They have web classes through high school level. And at an average of $5 per class (per family…you can have as many kids in front of the computer as you want) it’s super affordable. We actually tried out the 613.net classes. They are a wonderful couple and are truly doing such a hesed. I’m not sure if it’s because my kids didn’t have enough background, or because they really aren’t computer learners, but it was way over their head. They also had a hard time staying focused – I think in-person learning just works better for them now. We might try it again in the future, though. Hi Mara, I will be homeschooling my kiddos beginning in the fall (ages 9, 7, and 6). I spoke to Rabbi Resnick, and he said that his site is really for older kids- 9 is the youngest they have, and older would be better. I suspect that your kids are just too young for it. We haven’t tried any of the classes yet, but intend to after the summer break. I can’t speak from personal experience with the program, but it seems to be working well for a local homeschooling family. Hatzlachah! Ali – I think every state probably has different set-ups. In Kansas City, I just registered my kids for the Maize School District, and then they sent me the stuff 🙂 It was shockingly simple! If your state doesn’t have a homeschool district, then I don’t know how it would work. Can you talk to any other local homeschoolers – even if they are doing it, they might know if the option exists? What do your kids do the rest of the day to stay productive? Do the have 2 wake up at a certain time everyday? The whole homeschooling thing is so unfarmiliar to me but I imagine that your kids must have a lot of respect 4. I would think my kids would try to fight me on schoolwork if I was their teacher. My kids wake up EARLY. Much earlier than I do (of course I’m often up until 1 or later working, so I guess that’s why…). As for respect… That’s a sweet thought! In reality, I find that my boys are MUCH harder on me than they were on their teachers. We always got such great feedback from their teaches. I WISH they’d be as easy for me. I find that when I can work one-on-one with them, they’re great. But when they are competing for my attention against their brother, things get dicey. They do try to fight me on assignments – or just start with a complaint rather than an open mind (big pet peeve), but we’re working thru it. I think it’s natural when mom/dad is the teacher. Mara, Even though our kids are three+ grades apart, I think weshould do some Friday field trips together. We promised our kids we would take them to Truman’s house. Plus there are lots of plays/performances we can plug into. So proud of you for doing this! On the list of things I miss about America (you know, Target, Starbucks, coupons, Sundays, etc) is definitely homeschooling. I just felt that hsing my kids here, particularly right after aliyah, would have been an unmitigated disaster. It would have completly disrupted their klitah, and I am in no way prepared to prepare them for bagruyot in any of their kodesh here in Israel, and it was just WAY too much for me to even consider. And looking back on the last 12 months, it was DEFINITELY the right decision to put them in school. Totally agree. Even Oceans of Joy Aviva isn’t homeschooling in Israel. Frankie & I actually talked about HS when we WERE in Israel and he said no way – they’ll never learn “proper” (i.e. Israeli) Hebrew from us. Good luck on your home school journey; even though there may be days when you will want to send to children not only to school but to boarding school it can be very rewarding. From a budget point of view, the loss of one parent’s salary is the largest expense, it gets more expensive as they get older and watch for over due library books. Library books are a great money saver but fines should not be a budget item . For the skeptics, our older daughters and their friends were all accepted at good universities and have done well there. I assume our current home schooler will also get in to college in due time. Many Jewish home schoolers plan on either taking 2 or 3 weeks off before Pesach or doing an intensive amount of home economics those weeks. Subjects may include menu planning and nutrition on a changed diet, unit pricing and store comparisons, and of course cleaning. Also those weeks are good ones to give the students books to read on their own. That’s funny that you mention that about library book fines. We’ve had our share! Oh, this sounds so fun! I was home schooled by my mom from 3rd to 5th grade and I loved being about to do something a little different every day. Once I used a Calvert school plan (all of it was mailed to us back then, of course) but my mom didn’t want to again because it wasn’t advancing quickly enough for me. There also weren’t that many options for socializing with other home schooled kids like there are now. But that was the mid 90s (an eternity ago in terms of education technology), so who knows? How cool! I love talking to (formerly) homeschooled kids! I loved this blogpost! I especially like how you broke it down and explained it in such a clear way. Kol Hakavodon your homeschooling adventures! I have home schooled children (not my own) and as a teacher/educational consultant I have to say that there are so many wonderful benefits to homeschooling! Most likely, we will be doing the same thing in a few years but my hope is to start a Jewish Homeschooling Network where a few families to work together….we should talk sometime about this 🙂 Keep up the great work. I love following your blog! I know of a good piano teacher for you to “check out” – and she even lives in Pinehurst! Joan – Will you email me the information? Thank you! My fourth and second graders are at a Jewish school in the mornings, then I pick them up at noon and they do secular curriculum virtually. The virtual school is called Connections Academy that is partnering with Pearson company to provide a virtual kid-friendly educational platform. They also send a box full of year long materials and supplies, but everything could be done online. I am in a role of a learning coach whereas my kids have teachers who conduct weekly virtual live lessons in core subjects, call occasionally over the phone, and are accessible via web mail. Organized field trips are offered as well as abundance of club activities. Asya that sounds amazing. How did you convince the jewish school to let you do the secular subjects your own way? that seems to be hard to come by. Thanks. I love the thought and organization that went into this. This would not have been possible for me with 7 kids close together, (and totally disorganized). However, I wish I had done something for my youngest 2, now in high school and thoroughly turned off by the decreasing quality of their secular education and dismissive attitude towards parental input. My 6th will graduate this June, please Gd, but I am tempted to apply a few of these ideas to my 15 year old! Thank you so much Sara. I am so impressed by my friends with four or more children – especially close in age like yours. It’s never too late to make a change — and one of the things that this experience has taught me is that we are all teaching our kids, whether we officially homeschool or not! Mara: I happened upon your site tonight, just looking for a generic money-saving site. I am SO GLAD, I did!! Your site is full of so much wisdom and information. I am a SAHM with a 4th grader attending a very small Jewish day school, in Florida. It’s not working for us and hasn’t been for such a long time. I desperately want to HS my son, who has a learning disability. I am sure I can teach him his secular studies, but am challenged with my ability to instill the Jewish values and curriculum that he has been receiving at his day school. Your blog has given me so much information to check into. I am excited and recharged about the potential of actually being able to go forward with my plans. Thank you! Hi Cynthia – I’m so glad you found my site, too! I am actually going to be writing more about our homeschooling over the next year, so I hope that will be helpful to you as you go forward. I’m proud of you for being a strong advocate for your son! Our kids definitely deserve that! Please feel free to email me if you ever just want to bounce ideas around. I am far from the “model homeschooler”, but this year is better than last, so I feel like we’ve learned something! Mara: Thank you so much for your encouragement. I am a few months away from diving in. Right now, I am trying to find a 5th grade curriculum that will be easy enough for me to start, considering I am beginning “in the middle”. My son will be at sleep-away camp for 4 weeks, in June, so I plan to put my curriculum together then, so when he comes home, we are all ready to start in August. Lofty plans!